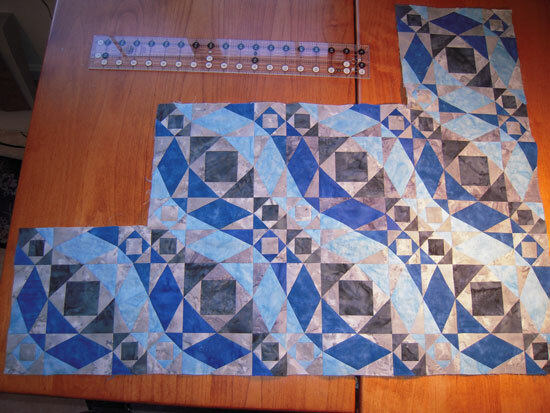 (5/22/2014) Hi, as promised I am continuing to republish the blogs I wrote as I worked through the making of “Waiting…” Several times I had put this aside for some months while I made other quilts. 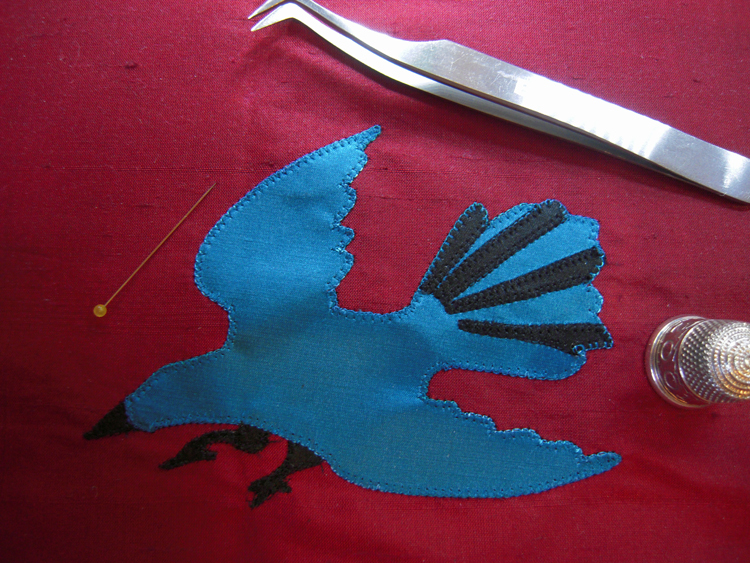 These posts talk about my experiment with piecing, and continues on about my work on digitizing this applique/embroidery piece in Bernina v6 software. In the end, I did not use it. It was too large for the hoop and I wanted a more delicate stitch-down of the sales. Instead I worked freehand directly on the quilt and used trapunto to puff out the sails. Nevertheless, it is a pretty nice clipper ship that fits in my jumbo hoop. I’ve been learning more about how to use Bernina 6.0 design software and was able to clean up my original in-the-hoop clipper ship considerably. I found how to remove overlap, and fixed a lot of other little things that make it look a lot better I think (you can scroll down and see the original from an earlier blog if you want). Here’s a pic of how the design looks now (it’s just an image, not the real applique/embroidery piece). 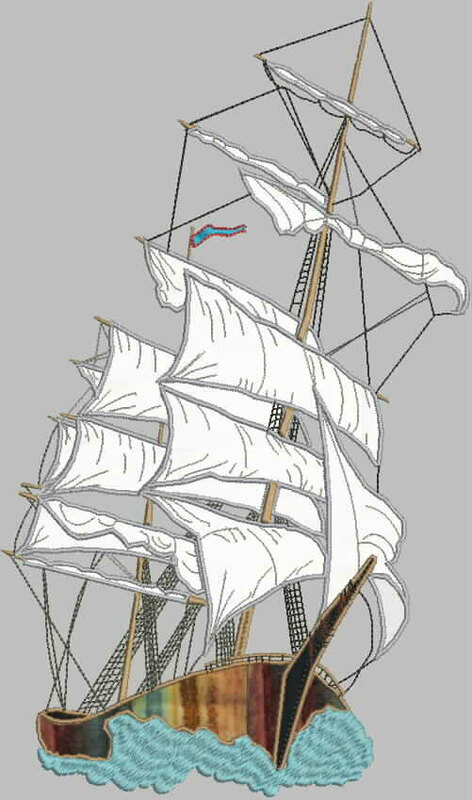 The sails and ship are appliqued and everything else is embroidery. The ship fabric, of course, is not what I will use, but it’s what they have in the selection and I haven’t scanned in anything else. I will probably hand piece or digitally paint a special piece of fabric for the boat to use with the in-the-hoop design that will show the wooden sides of the boat properly oriented. I find it so exciting that I can put this together in the hoop. We’ll see what it looks like when I stitch it out.Anyway, I plan on using this on my storm at sea quilt. This fits into a jumbo hoop for the Bernina 830. We’ll see how it stitches out. Idea: Eventually, I hope to have a variety of items like this for download from my website for people who have Berninas. I haven’t figured out if it can be done for other machines or not, nor do I know what, if anything, I have to do legally before I can share or sell my own designs I make in Bernina software. But I’ll find out both of those things and take care of any obstacles before or if I do that. I have in mind making in-the-hoop applique/embroidery items such as Nativity figures, old tall ships of several varieties, women and men in historic poses and costumes, and other items for others to be able to download and use on their own quilts and wall hangings. 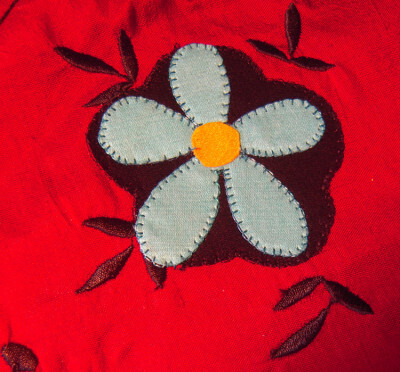 Some would be accompanied by digital pictures that could be printed on fabric and used in the appliques (like the faces of the people or the boat sides, for instance). What do you think about this idea? 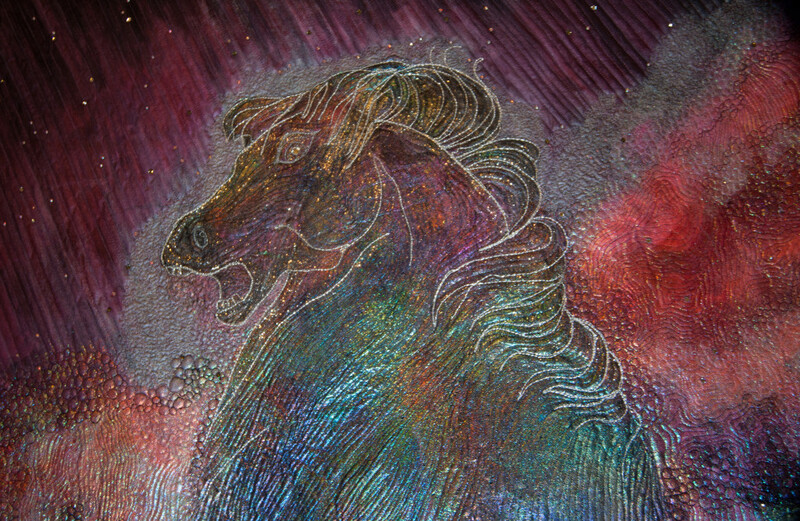 I have started a new art quilt to accompany my work on the Horsehead Nebula quilt because I like to have several quilts going at once, and this one requires piecing some traditional blocks. 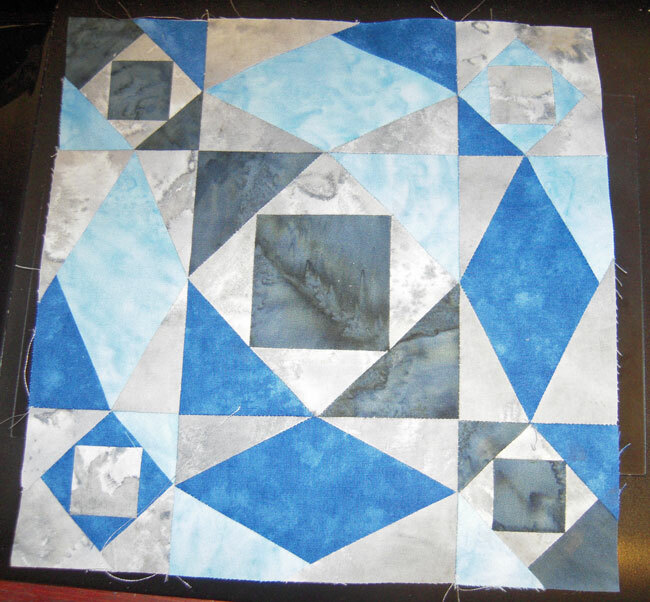 I have several of these quilts in mind to make over the next year–Storm at Sea, Jacob’s Ladder, Bear Paw. 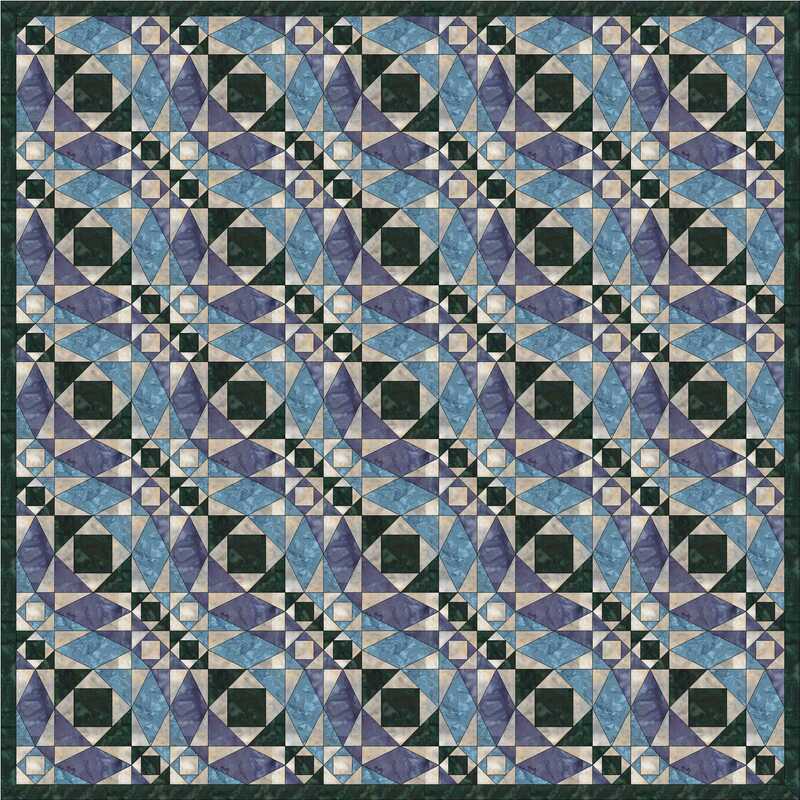 All will be pictorial quilts, but somewhere in the quilt there will be the traditional block that inspired the quilt. Sew I’m starting with Storm at Sea. It’s square even though the picture doesn’t look like it. It takes for-ev-er to make. I got the foundation pattern from Electric Quilt 7. I’ll show you more as I get more done. TITLE: Storm at Sea: One of these things is not like the other! I have developed a keen appreciation for those of you who do a lot of piecing. This has been one challenging project so far. I finally have the wave constructed, though I must rip out one of the blocks, fix it, and put it back. Can you spot the errant block and tell me what is wrong with it…hint…there is more than one thing? Anyway, as you can see, I am making progress. Today I have been correcting a lot of little places where the points weren’t quite matching, and as soon as I fix the one block, I will have completed the wave for my storm at sea pictorial quilt. Here is a picture to let you know how I am going to use this. The ship is the wrong ship, and there is a lot more to the quilt, but thought you’d like to know how this is “the big wave” as I think of it. Anyway, we are having one of those times when the weather is absolutely exquisite. It’s clear, just the right temperature and altogether lovely. Already it is well after noon and I haven’t had lunch yet. Perhaps I will take a walk and then light late lunch on the deck. I would love to hear your responses on the overall look and, of course, the identification of the mistakes. Truly! (19 May 2014) The following five posts from the archives of my old blog tell the story of how and when I began the design work on my quilt “Waiting…” which I finished this year. It so far has been a semifinalist in Mid-Atlantic Quilt Festival 2014, was shown at HMQS 2014, and has just been juried into AQS Charlotte. This is not the whole story of the making of this quilt, and my next “From the Archives” later this week will continue the saga. Pay attention to the dates as you read through this set of blogposts. Sometimes a quilt concept is kind of like a flower. It starts as a kernel of thought and grows until I start to really begin to see it in my head, but as I work through it, it takes on some different colors and shapes and ideas. I have had this idea about a storm at sea for some time. It seems really hard to do, but today I managed to come up with a beginnings of a concept. 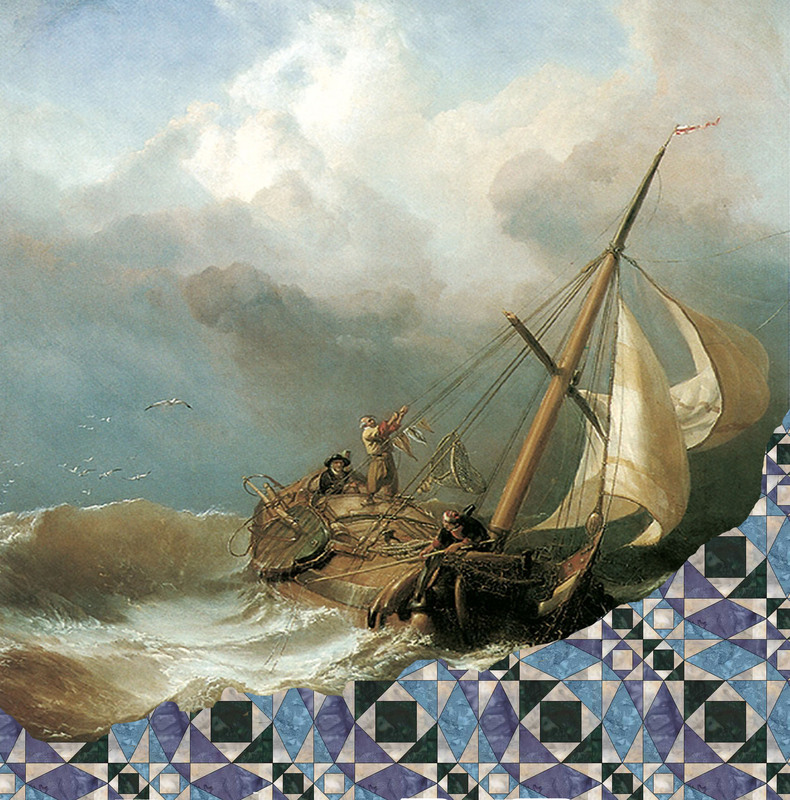 I may change the stormy ship scene and I would add some angelina fibers along the edge where the pieced part joins the stormy picture to make it look like waves or something, but I drew this concept using a combination of EQ7 (designed the storm at sea using their blocks, placed fabrics I wanted in it, exported it as a jpg file) and Photoshop elements (using layers, erasers and so forth). The sea picture is from Dover’s 120 Great Maritime Paintings, and is kind of an idea place holder at the moment. What do you think of this concept? Have I described it well enough? Anyway, All I can say about the first week in this new adventure is that it is truly amazingly interesting and fun, even if I did cut my finger cooking and am disappointed with the sky quilting in my Knight quilt…I didn’t cut it badly enough for stitches, but bad enough to interfere with my quilting. Still, altogether a great first week! Have a wonderful weekend, and comment on my idea if you would please. I am still working on my fairy garden, but the wind storm we had the other day made me consider starting work on my Storm at Sea also. I like to keep about two designs going at once so if I get a little discouraged or tired of working on one, I can move to the other one. It works best for me to have two entirely different atmospherics for simultaneous projects. An interesting border of some kind that I haven’t fully decided to include yet. 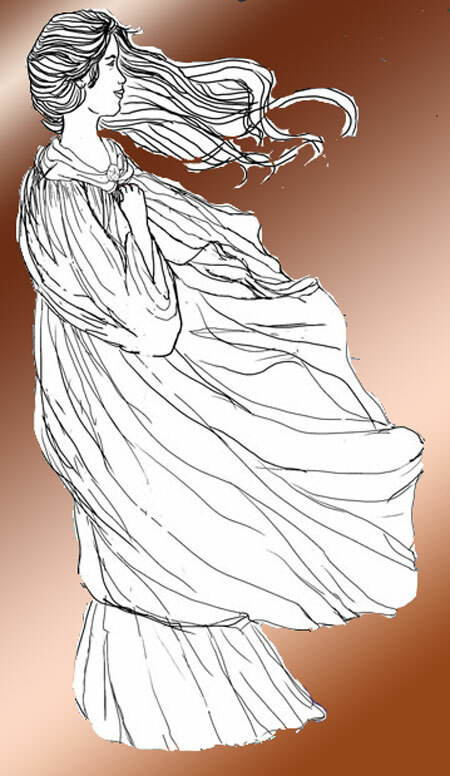 And POSSIBLY, a woman standing on the bank very near the viewer looking out to the sea scene with her hair and cape blowing in the wind. This may end up in another quilt though–perhaps a companion piece. I still have to find the right inspirational picture for the tall ship and the lighthouse. I think I’ll have to draw the woman from scratch since I have looked high and low for a royalty free picture that matches the one in my head…but at least her back will be to the viewer, so that should help. I wish I could just take a photo of the quilt in my head and digitize that. Hope you have all been having a wonderful Thanksgiving weekend. 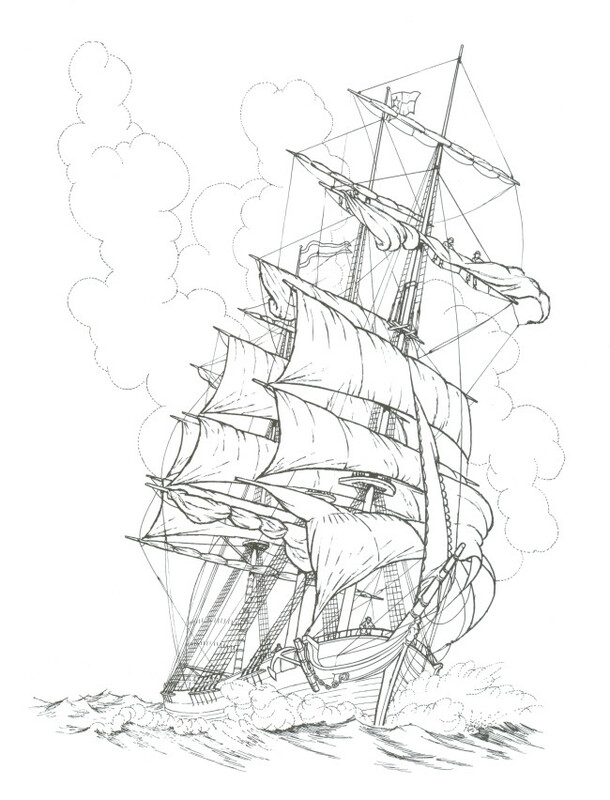 I think I found the right clipper ship for my storm at sea quilt–it’s again from a Dover coloring book. I am going to try something I haven’t ever done before and that is converting this into a Bernina applique with embroidery to create in my new jumbo hoop on the Bernina 830. I will have to work through how to do this because it’s a new venture for me. If any of you who have done this want to give me hints please drop your comments here or send them to me at bjfabricartist@gmail.com. I believe this will allow me to have the kind of detail on the rigging and sails that I would like to see, and I think the jumbo hoop is about the right size for the ship, but I may need to do two hoopings to get it all done right. I may also decide to do some of the rigging details when I do the quilting. Also, I have begun drawing the woman. One of my friends suggests she looks more like she’s wearing a smock than a cloak and that she needs a hood on the cloak. I think she’s right. Here is the draft. I drew this all on my own without an inspirational picture because I couldn’t find anything close to what I wanted. I gave her a little background so you could see her better. What do you think? So, you see, one of my methods for developing an art quilt design is to keep working through each problem set in individual segments and then put it all together into a whole design. This is possible to do with paper and tape and so forth–it’s how I used to work–but the computer helps a lot, easing the resizing and changes for me. For instance, her hand was too small, and I was able to cut it out and resize it without redrawing it and then put it back in place, fixing the few lines around it. Once I have the whole design put together I will spend some time perfecting it and fixing little problems and deciding how to make each section in fabric, thread, and maybe a little paint. I will make notes on my decisions. After that, I will make a pattern, and print it out. I usually start with three copies. I will run a blog once I complete either the fairy garden or the storm at sea design on my pattern-making method using Excel spreadsheet and freezer paper. 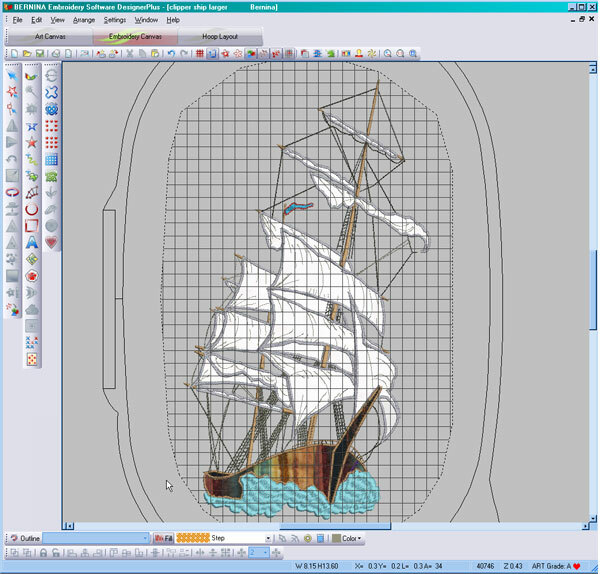 Today I played around with my Bernina 6.0 design software to see if I could turn the clipper ship into a digitized applique with embroidery for details. I have gotten far enough to determine that it can be done, but I have also found it requires a bit of learning. In fact, I am kind of excited about the prospect and began dreaming about all I could do with it…digitizing the knight, the Geisha, the mermaid and her shell all as digital appliques plus all the neat new ideas this engenders.But in the end, after about three hours of working to that end on the clipper ship, I made a wrong turn and lost it. Though discouraging, it wasn’t quite right anyway and I learned a lot in the process. I then turned to the Webinair they have online at BerninaUSA and went through that plus printed out some instruction sheets they have. I should have done this in the first place. Hahahaha…silly me. .
I’ll try again with this little bit more how to instruction, but I have to go out to the fabric store tomorrow to pick up some quilting fabrics…some more blues and grays for the Storm at Sea and some dark background fabrics–perhaps dark greens and purples for the fairy garden. 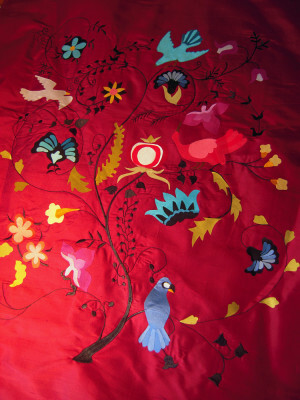 The fairy garden is going to be my Hoffman Challenge quilt for 2012, I think, if I like the design when it’s done. 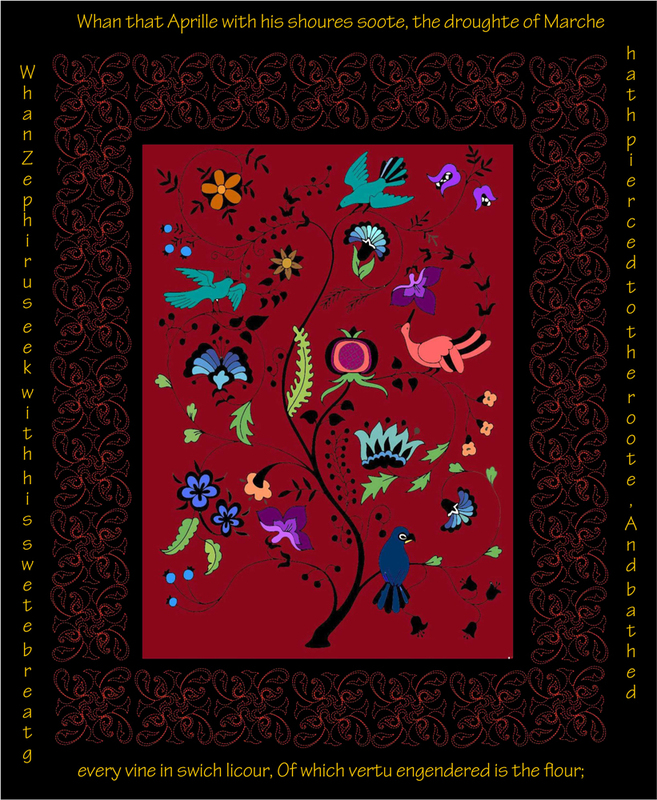 I’ll get back to capturing the journey toward drawing up the quilt designs in this blog later this week. I hope you are working on your designs too. So here’s my question for you…do you read the directions or watch a how-to video BEFORE you start playing with new software or do you just plunge in like I do? Most of the time that works, but in this case….I should have prepared better. 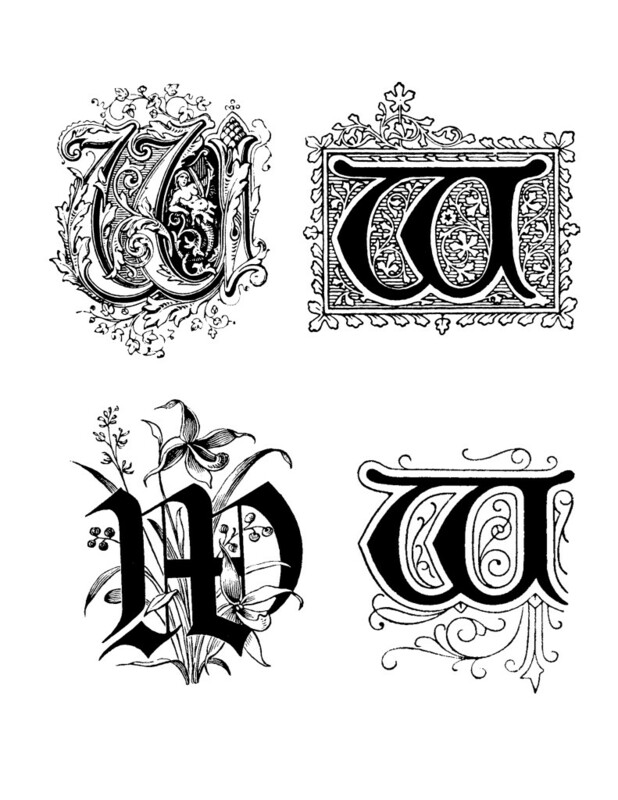 Still, I find the idea of digital applique exciting. I think I need to work on a simpler sewing/quilting project also just for relaxation. I could use it to learn to quilt on my new Bernina before I tackle the competition pieces. Hmmmm…any ideas? Have a great rest of the week. I hope you find some time to do some playing with fabrics and threads. Well, after a lot of hours learning the software and working through things I managed to work out the in-the-hoop applique with embroidery in my Bernina software. I will say it was a little tough to learn but once I figured it out it wasn’t very difficult. It really helped a huge amount to have my Wacom digital drawing tablet, but it would be possible to do with just a mouse. And, it would also be possible to make such an applique and do the embroidery freeform by machine if you don’t have an in-the-hoop option. Here’s an image of the design. Note that the fabrics shown are just selected from what they had available. I will have different fabrics for the boat, perhaps even paint it a little, and more off white for the sails. But this at least gives an idea of what it might look like. 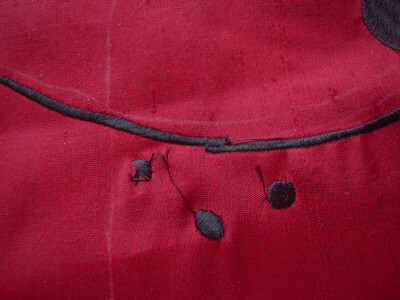 I am currently in the process of stitching down all those little applique pieces on the red section of my little Chaucer quilt. I’m about halfway through that and my shoulders and neck are kind of hurting now, so I thought I would stop for a bit and work on the words section. 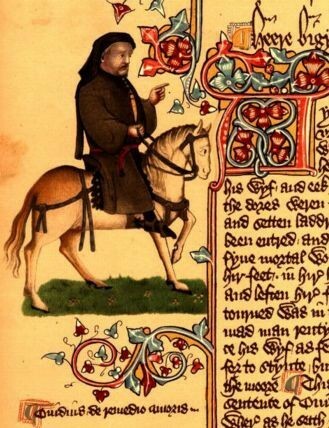 Think of this as a page in a Medieval illuminated book. 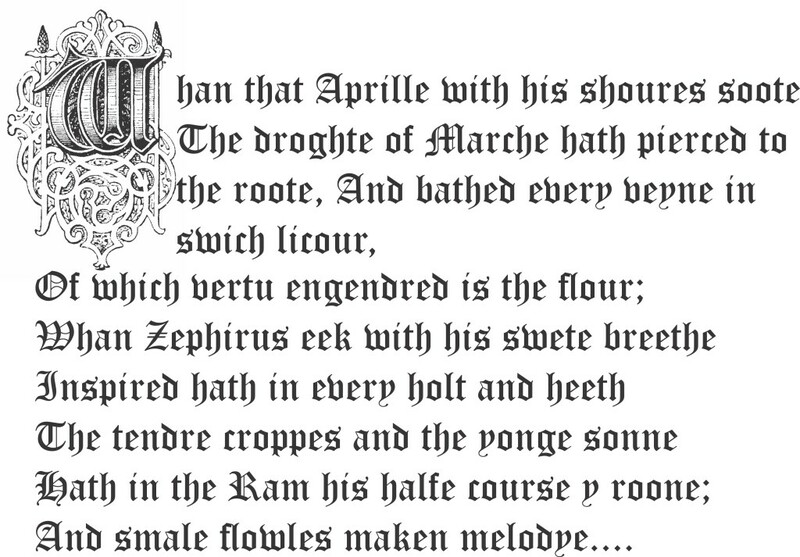 The red part is in the upper center and below that is the verse in a Medieval style text box. The border around the edge is probably still going to be black, but will be quilted in metallic threads (I think…may change my mind on that). I did a mock up of what I am thinking as far as the text box. I am planning on trying a tea-dye on some white silk/cotton Radiance and will try adding some additional aging with a very thin bit of watered down brown Setacolor inks. Here are the words I am going to include. I am going to try to digitize this in Bernina v6 so I can get it embroidered in the hoop. I have all the appliques cut and fused down. They are made from silk/cotton blend Radiance that I purchased at a quilt show. The appliques are tiny with little pieces, so I was able to do all of them from the 10 inch squares I bought in a collection of colors. I even have enough left to do a second quilt like this. 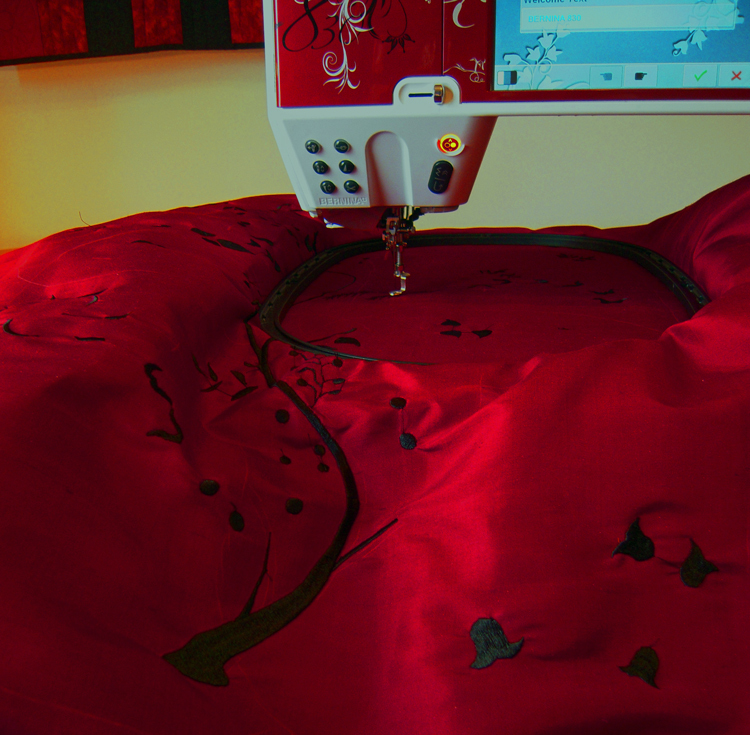 I love doing machine stitched appliques both fused stitched raw-edge, like I am doing here, and turned edge, machine stitched. Since these are so tiny with complex edges, I decided on the stitched-raw edge for this quilt. The stitch I use depends on the look I am going for. In this case, this folk-art influenced quilt works well with the blanket/applique stitch. 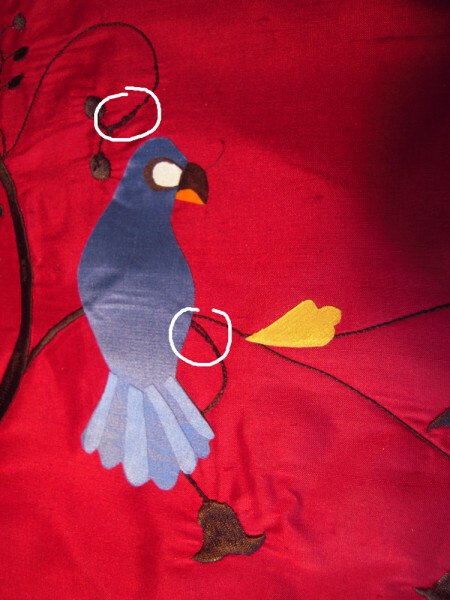 Note that satin stitch, double blanket stitch, and some decorative stitches also work well. Here’s a little example, and I do mean LITTLE! The flower here is a little more than one inch across. Sew remember to use the photography test for your own work. I’ll fix this. I am experimenting with a new setup for my stitched-raw edge applique because it is SO SMALL and requires so much turning to keep the blanket/applique stitch at the right angle. I took an old super slider I had that was a little worn around the stitch hole and cut it so my feed dogs are exposed. I think this will help me move the quilt top around easier and more accurately. You see the disadvantage, though is I have to change thread colors a lot for this quilt, which means taking it up and putting it back every bobbin color change. I’ll let you know if it makes enough positive advantage to use it despite the thread changes. Sew happy everyone, and happy Mother’s Day to all you mothers out there. Hi there. So glad you stopped by to pay me a visit. I have established this website to share my quilting and sewing journey and techniques with anyone who may be interested. Eventually, I may sell my quilts and other items I make from this site, but not yet. I love fabric art of all kinds, including art quilting, traditional quilting, wearable art, bags, heirloom sewing, and even basic sewing and tailoring. I love looking at it, making it, wearing it, hanging it on the wall, photographing it, and studying it. Years ago, I had my own fashion design and tailoring business where I designed and made clothing for both men and women. I made everything from men’s suits and tuxedos to bridal gowns and tailored women’s clothing. In more recent years, I have taken up quilting at the urging of my delightful daughter-in-law, Beth, who is also a quilter. It was a wonderful solace for me following my dear husband Marvin’s passing a few years ago. I now find that I have a real and abiding passion for making wall art quilts of various sizes primarily for competition and have spent the last couple of years honing my techniques and turning my fashion making skills into quilt making skills. I have a long background of work with fabrics and threads, having learned to sew from my mother, who started teaching me when I was 5 or 6. She also taught me to knit, hand embroider, and crochet, though I was never very good at the latter. She was a very advanced fabric artist herself, although she trended toward the traditional highly advanced needlearts. I wish she were still here today to share our needlework. Now, I love the new techniques, supplies, and technologies that have enabled me to go so far beyond what I ever thought I could, even though I have a full time job elsewhere. But I am nearing my retirement, and hope to dedicate a lot more time to play with fabrics and thread and even paint on fabrics. I have a bit of an art background, though not as much as I would like. I took many art classes in both high school and college and occasionally private lessons. Perhaps I will take more such classes after I retire. I studied music at the University of Iowa and also graduated from George Washington University in International Affairs. I have traveled all over the world and the United States to many interesting places over the years But now, my favorite place is at home in my small, but almost adequate, quilt studio, or at quilt shows. I have two wonderful grown sons, one of whom is married to Beth, and one who still lives with me. I have a grandson, Kevin, who is eight at the time of this writing. I believe that the Lord has given me the talents and the opportunities I have to be creative, and that belief is often reflected in my art quilts in particular. Some of the quilts I have made are actually banners designed for churches. I hope we will have a lot of fun together, and I will be able to provide a little help to other fabric artists and also hope I will learn from you all. My favorite websites for these pursuits include The Quilt Show, MQResource, and Ravelry. I also love photography and writing. Oh my, there just simply is not enough time in a day!!! Sew next I started testing out the applique methods. Here’s my first test–stitched raw edge applique using Bernina’s single blanket/applique stitch set at 1.5 width and 1.5 length, The blue thread is Superior Rainbow, and the Black is Superior Bottom Line. Wing details and the like would be quilted in, and the eye would be a bead. I put some items in the picture so you can see how really small the bird is. For some reason close-up photos like this don’t show the nice sheen that the silk dupioni and the Radiance has, but you can get the idea I think. News: I figured out how to transfer my subscribers list…a few were lost in the process because I failed to copy one of the pages before the old blog was deleted that I didn’t realize I had, but it should not have been more than 3 or 4. I hope you catch it if you were one of those. If you don’t want the subscription click on your profile link under the subscrib2 section on the right. There is a button to click to unsubscribe. Hooray! That makes it all complete. The old back blogs will start appearing this Thursday as “From the Archives” posts. 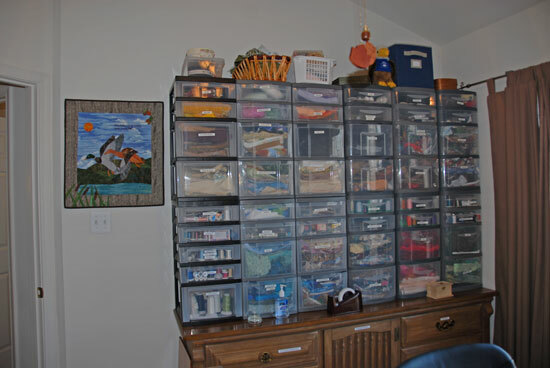 I hear a lot of embarrassment out there from my sewing friends about the size of their stashes, but I say don’t be embarrassed, but be grateful and manage those stashed right into productivity. It just needs a realization that there is a huge value to having well-stocked stashes collected over time and properly managed. 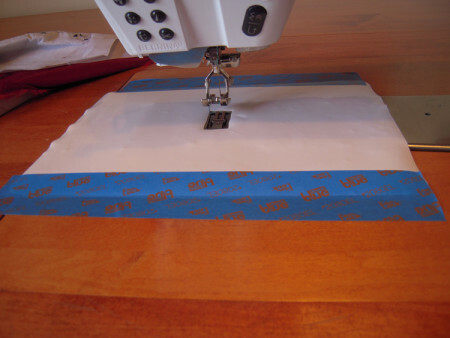 I began this practice decades ago when I first used sewing as a supplemental income when my children were very small and improved it substantially since retiring a couple of years ago. What kinds of stashes do you have? 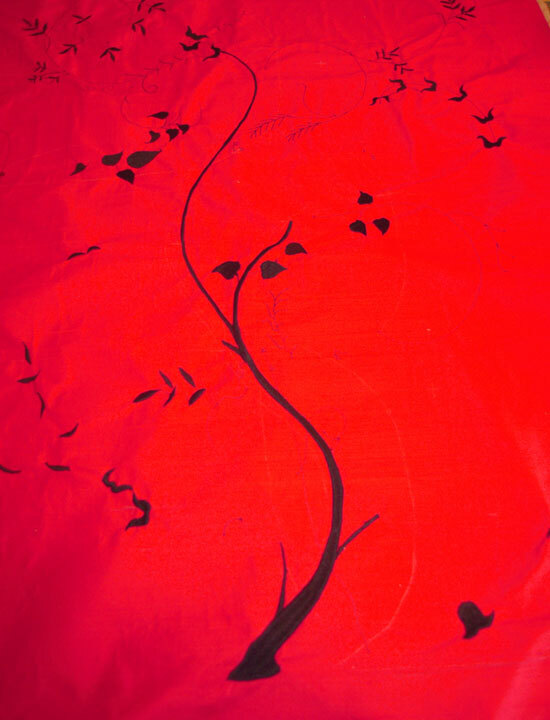 I have several types of stashes–quilting cottons, various types of silks, light woolens, denims, etc. in the fabrics sections. But my thread stashes have significantly grown since I retired. My favorite threads are #30 and #40 polyester solids and variegated embroidery threads, #100 silk threads, #12 and #16 perle cotton threads, and #8 perle cottons and Razzle Dazzle and other decorative bobbin and hand embroidery threads, and hand quilting threads that I use for hand sewing beads onto my creations. I also have a collection of buttons, beads, sequins, fabric paints and markers, brushes, stabilizers, interfacing, bag making specialty parts, and needles of all descriptions. I also have a very nice collection of tools. I did not collect these all at once, but over the course of many decades and some of these items are inherited and older than me. In the past few years I have given away a large amount of fabrics for clothing that I know I will never make. I had decided I need to give away a lot out of my quilting fabrics stash because they no longer appeal to my tastes (funny how that happens), but instead I decided to design several very quick to make quilts that are still pretty, and take those fabrics and make them into pre-cut kits, using my die cutter, that I will either sew up myself or convince some of my friends to sew for people in need. We’ll see if this works or not. I’ve only just started this. My ultimate goal is to reach a point where the fabrics in my stash are the ones I will use so my stuffed full drawers will once again resemble a nicely organized stash, that I have the stabilizers, battings, beads, buttons, and threads I need most of the time and don’t have to delay a project to order them (my “local” quilt shop is 45 minutes away, and the brands I like are not often available, so I buy my threads online). Sew I have learned that a small part of my in-the-studio time has to go to managing my projects and stashes in order to keep more productive and the costs spread out across time (as you know threads and fabrics are so expensive…it just helps to have built a stash and keep it stocked so I don’t have to spend a big amount at the beginning of each project), and my fabric art humming along. I realize a lot of you are far better organized than me, but I encourage you if you haven’t done so to take a look at your own stashes and projects and do a little managing and organizing and your productivity and imagination may just take off and soar in ways you don’t expect. And you’ll probably save a little money too. Sew! I completed the in-the-hoop embroidery on the new piece of wine red dupioni. I had digitized this from my design and it required five jumbo hoopings for Gibbs (my Bernina 830 LE) to stitch it out. I have a problem getting those alignment marks they put in there in good places. As far as I know, there is no way to adjust the placement of them, so I ignore them. This requires that I print out the full sized template from my software, tape it together, mark where the hoops go and the center mark for each hoop, and cross my fingers as I hoop them. For the most part, I am usually successful, but it requires close watching and sometimes a large amount of adjustment. For some reason when I get the hoop placement just right so everything is green in the computer (that means they fit in the hoop and the whole design is covered), and then save it to the USB stick, it isn’t the same when I sneaker net it to Gibbs, and is often totally off. Anyway, I’m very happy overall with the embroidery, and the next step, after I fix those small errors in the embr is a lot of bobbin embroidery from the back using # 8 Perle Cotton. Once that is completed, I will start on the appliques. 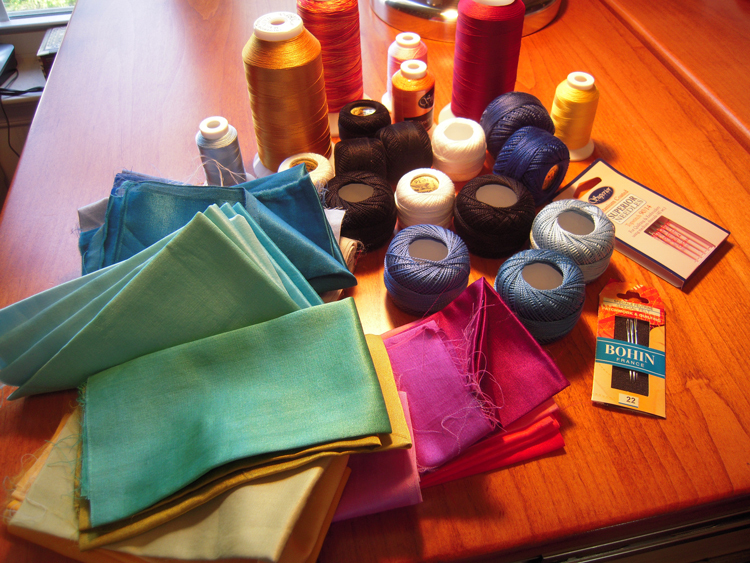 I have so many lovely colors of Radiance 10 inch squares and a few larger pieces from which to make the appliques. I think the hooping was the most stressful part of making the quilt top, so I’m glad that is behind me. I have to embroider the words, but thanks to a friend’s suggestion, I have a new idea for how to go beyond this central part of the quilt that places the words better and will also make them easier to embroider. Hopefully I can fit them all in one hoop! I know I will have to do a dramatically wonderful job of quilting this, and I am planning on marking it pretty fully once I figure out how to quilt it. I’ll be asking you all for suggestions once I have the top finished. As some of you know, I finished Sky Horse and sent in my application to try to get it into IQA Houston this year. I am not posting a full photo of it until after its first show debut, but thought since I had spent many hours archiving the old blog and figuring out the new blog that I would celebrate by posting a picture of the horsehead itself. You may not be aware, or perhaps you are, that decades ago I had my own fashion design business during which I designed and made a number of elaborate wedding dresses and special occasion dresses. 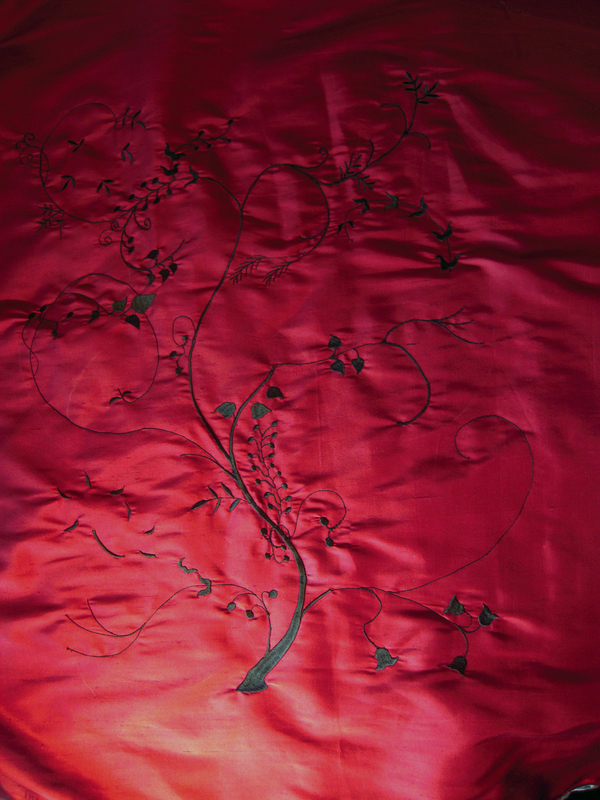 I worked a lot with silk, and embroidery, and beads. I would have LOVED to have had the equipment I have today to work with. So in its way, this little quilt is a nod to that period of my life when I lived in Ithaca, New York, my children were little, and I did a lot of singing, sewing, gardening, and fashion design. Sew sometimes you have to start things over…blogs, quilts, plans for the future…either to keep moving forward or to make things come out right in the end. Unfortunately, I cannot figure out how to restore the list of those subscribed to this blog, so if you want to receive an email when I post a new blog, PLEASE resubscribe. Thanks!